(1962) Gianna Maria Canale, Anthony Steel, Carlo Ninchi, Maria Spina. 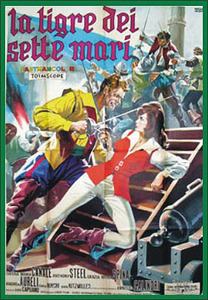 Tiger is the skipper of a pirate-ship who wants to “retire.” Having no son to leave command to (he only has a daughter—Canale) He decides to leave the command and the ship to the winner of a challenge among his crew. Much to his surprise, his daughter wins the challenge! Things get even more complicated when Tiger ends of murdered. Nice color, from 16mm.